The Ethiopian Sports Federation in North America (ESFNA) would like to provide a first-hand update of the lineup changes for this year, as a courtesy to our guests. Our goal is to eliminate any potential confusion from the dissemination of conflicting information regarding changes to ESFNA's 2015 entertainment lineup. The Saturday Closing Night Show remains unchanged and the Friday Night Concert will feature Jacky Gosee and the legendary Aster Aweke. These shows will go on as previously scheduled. The Thursday concert has been cancelled. Teddy Afro and Gossaye are unable to travel to the U.S. and therefore their concert was cancelled. This unfortunate turn of events was beyond the control of ESFNA. In place of the Teddy Afro and Gossaye are unable to travel to the U.S. and therefore their concert was cancelled. This unfortunate turn of events was beyond the control of ESFNA. In place of Teddy Afro and Gossaye concert, ESFNA announces that a Unity DJ Party will be held tonight, featuring DJ Mamush, DJ Luda, DJ Armageddon and additional prominent DJ's in partnership with Team Cheb Cheb DMV and Addis All-Stars. Tickets for Friday’s Concert and Saturday’s Closing night are available at Byrd Stadium and key Ethiopian businesses in the metro area. For VIP/ Table Service, please visit www.esfna.net or call 240-476-2342. 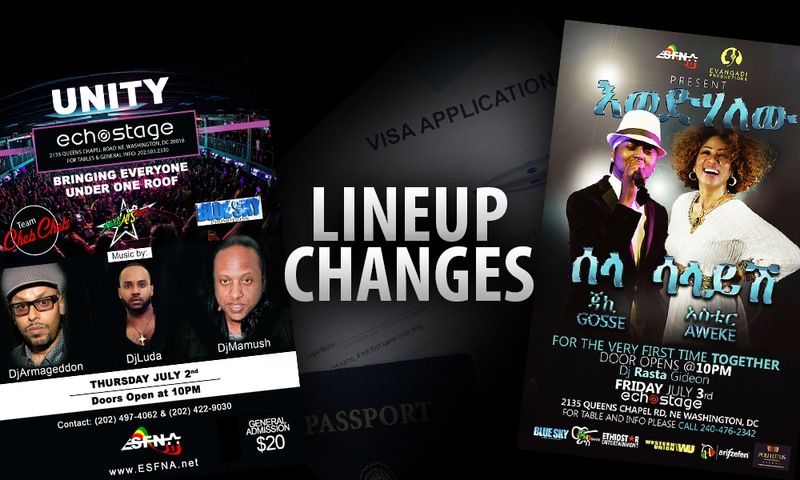 Refunds have already been processed for all customers who purchased presale tickets to the Teddy Afro & Gossaye event on our website. Refunds will take 5 to 10 days to appear on your statement. A receipt of the refund has been sent to the e-mail address provided upon purchase. Please check your spam or junk folders if you do not see your receipt. If you purchased a ticket online and have not received your receipt via e-mail, please contact Samson Mulugeta at pr@esfna.net with your information to confirm your refund. Once again, all events will begin at 10 PM and will take place at the state-of-the-art Echostage. ESFNA genuinely appreciates the support and understanding of its guests as the Federation has been forced to adjust its 2015 entertainment schedule due to unforeseen circumstances that are beyond its control.